I was invited to a private dining event with James Martin at his beautiful house in the countryside on Thursday evening last week. 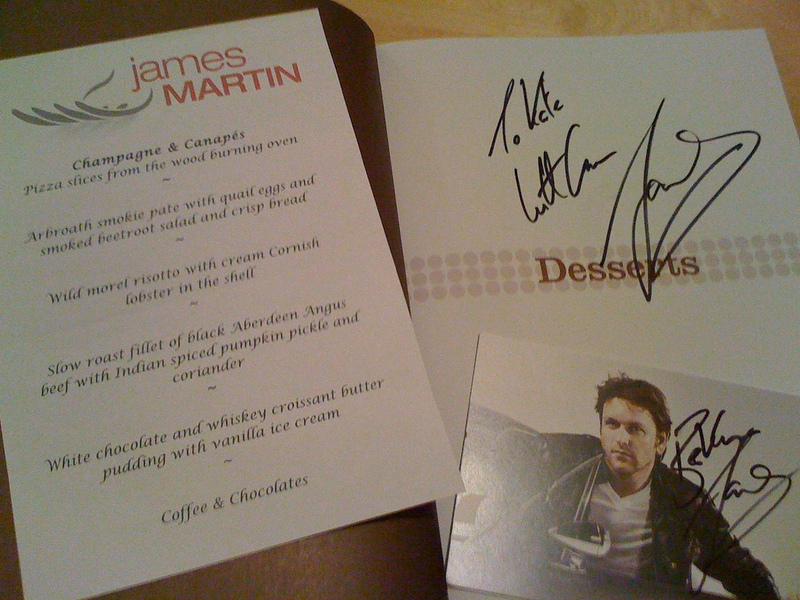 Me, Mr TOTKat and 20 other people were guests of James Martin for an evening, to partake of his fantastic cooking and take a look at his collection of motorised vehicles. We were greeted at the gate by James, who shook our hands and showed us into the wing we'd be in for the event - a great conservatory-type part of the house which had a wood-fired pizza oven outside on the enormous patio and a reasonable sized kitchen as part of the large dining room with a mezzanine level (with a billiards table on it and plenty of room to play a game or two as some did between dessert and the coffee course) looking down onto the cooking area. On the huge wall behind the cooking area was a huge clock face, from head height all the way up to the top of the mezzanine level height, with large brass numbers. Gorgeous thing! James introduced the evening and his team to us all and explained that he only does this sort of event once every couple of years, so it really was a special evening ahead of us. James and his right-hand man Chris prepared an amazing meal from pizza canapes through to slabs of chocolate with dessert; starting with a glass or two of champagne and meeting some of the other people there while one of James' other people (whose name I forget - argh!) handed 'round the little slice of freshly made pizza. Then at around 8.30pm we sat down for the starter of Arbroath smokie pate on smoked beetroot slices (peeled and boiled for many hours, then sliced thinly and smoked over oak chips) with a twirly crisp of bread and a perfectly cooked quail's egg. This was served with a really nice Puligny-Montrachet which carried on into the next course of wild Morel risotto with cream Cornish lobster in the shell - half a small lobster with some of the best risotto I've ever had. James was very clear in pointing out that a good risotto not only had butter, wine and parmesan but it really has to have mascarpone in it too. I am -so- not arguing and the second helping he was dolloping out for those of us with bottomless stomachs pretty much sealed that thought for me. Then came the slow roast fillet of beef - done in a water bath at 65C for lots of hours, served with a quite subtle Margaux. I'm usually one for a much more hefty red but the Margaux was nice for a change and went well with the beef and stood up to the Indian spiced pumpkin pickle and nice fat dollop of mashed potato, heavy with cream and butter. Fudge-the-dog came in for a bit of company and some beef treats. He's a lovely old and well behaved slobberer that dog. Then, I think it was at this point that we went for a look in the garages at the cars, bikes, model planes and all sorts of other vehicles. James fired up the classic Ferrari 275; what a hell of a racket! And the 1967 Mustang... RAAARRR! And we poked about with the teeny Fiat, an R8, a Mini and probably lots lots more, but I was a bit pickled by this point so it's a bit fuzzy. Back over to the dining room, via a look at one of the other guest's McLaren Mercedes SLR and we finished up with the dish to which James attributes the kick-off of his career - white chocolate and whiskey croissant butter pudding with vanilla ice-cream. Which was heavenly. And lots of it, so another course with seconds! Yay! Lots of good conversation with the other guests (not so much James himself as our placement on the table meant we weren't in an easily accessible position, though plenty of other guests got lots of time and attention from him and the dog) over the enormous slabs of chocolate with coffee after the dessert and at around 1.30am we decided it was time to make track with the help of Pippa (James' PA), we picked up a signed book as a parting gift from James and got a car back to the hotel and crashed into bed ready for a 6am start to get back into town the next morning to work. We had a great night and I'm really pleased that we got the opportunity to go and experience the evening's event. James is a really nice guy, passionate about his food, his cars and his dog. Saturday Kitchen will never be the same again for me.